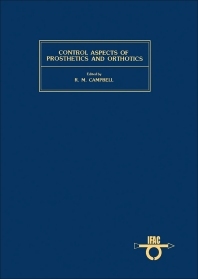 Control Aspects of Prosthetics and Orthotics covers the proceedings of the International Federation of Automatic Control (IFAC) Symposium that tackles issues relating to the control systems of prosthetics and orthotics device. The book organizes topics according to the sessions of the symposium. Session 1 deals with the functional muscle and nerve simulation, while Session 2 discusses the man-machine mechanical and information interface. The third session covers sensory replacement and artificial organs, while the fourth session tackles instrumentation, medical devices, and clinical procedures. The last session discusses robotics and mechanics. The text will be of great interest to physicians, physical therapists, orthotists, and prosthetists, whose line of work involves prosthetics and orthotics systems.